It's time to celebrate a very happy unbirthday to you! Click here to play! You're invited to the Mad Hatters party for some cake, tea and plenty of chances to win big! You can't attend a Mad Hatter party without a fabulous hat, so you'll just have to spin one on the reels. Spin the red top hat as much as possible as this fashionable accessory acts as a wild symbol! It will also bring in up to 20000 coins if you can spin five of them across an active pay line. There are also a few unbirthday party guests to mingle with in this fun party: the three mad hatters. Spin three to five of any of these jovial characters and you could bring in up to 2000, 1500 or 1000 coins respectively. What's a party without treats? Spin three to five teapots to gain up to 400 coins, and three to five slices of delicious chocolate cake will get you 200 coins. Plus, there's ice cream, cups of tea and cupcakes. Sample them all to bring in the wins! As you might expect, these mad hatters have a couple of surprises for you. Firstly is the scatter Cuckoo bonus that will get you a bonus cash prize if you can spin three of them anywhere on the board. Also watch out for the white rabbit. This little bunny will trigger a number of free spins if you can capture him across the reels. 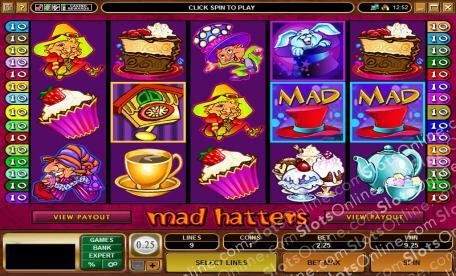 So, spin these reels and get ready for an unforgettable unbirthday with the mad hatters! The white rabbit acts as a scatter. If you can spin this little bunny three to five times anywhere on the board, you will get up to 50 free spins. Prizes are doubled during free spins, and you have the option of picking an extra wild symbol to appear on the reels during your spins. They will substitute for all other symbols except scatters and bonuses. The white rabbit will also multiply your total bet by up to 300 times if you spin him three to five times anywhere on the board. The red top hat acts as a wild symbol. Spin three to five across an active pay line and you will get up to 20000 coins. It will also replace all other symbols (excluding scatters and bonuses) to help you create more wins! The Cuckoo Clock will trigger a bonus game if you can spin three of them on adjacent reels. During this game you will be prompted to choose from a selection of boxes. Pick up to three Cuckoo Clocks and you'll win up to 13500 coins!